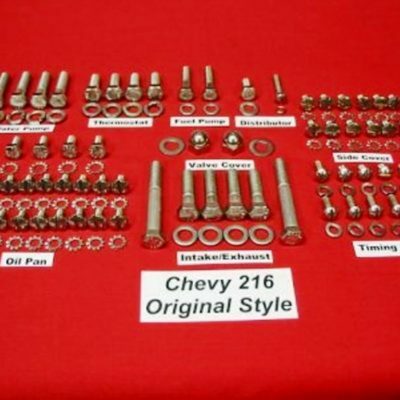 Dress up your 194 230 250 292 Chevy engine with this 147-Piece stainless steel Hex Head bolt kit. This kit is guaranteed to fit! 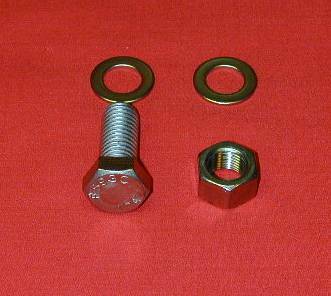 The kit includes the proper flat washers to insure that your Oil Pan, Valve Cover, Etc. get the proper support that is essential for a good, long lasting seal. 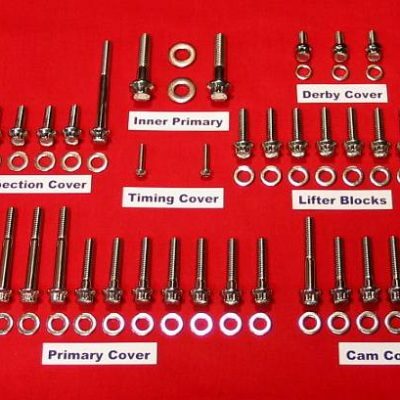 Please note that the 250 & 292 engine uses a different water pump bolt set, so please notify us if you are purchasing this kit for a 250 or 292 engine and we will include the correct water pump set. 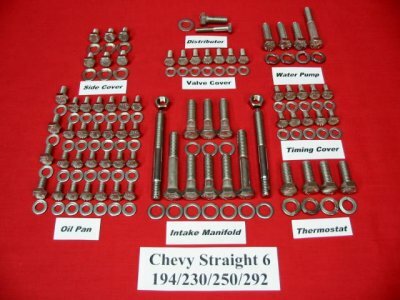 If you need any bolt substitutions for aluminum valve covers or any other non-stock parts on your engine, please email or call us and we will gladly substitute them for you. 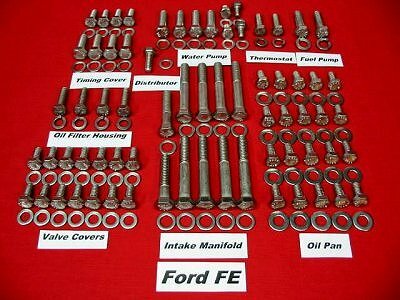 We recommend using anti-seize at all thread points. Not just good; outstanding! I went with clear engine paint and as it turns out, the stainless kit is the highlight of the “bare metal” look of my Chevy 292. The labeled, individual packages are really useful and it’s top quality hardware. If you’ve ever been frustrated by inferior hardware or spending hours scrubbing, tagging and bagging fastners, (or decided it wasn’t necessary to tag and bag like I did), this is quite possibly the very best value of an entire project. I’ll be ordering one for every engine I build! As a Harley engine re-builder, I had a customer bring a complete set of AlloyBoltz into my shop for installation on his 2001 Fatboy. 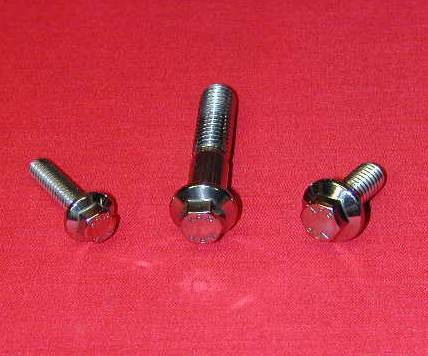 These were the 12-point stainless type, and I was immediately impressed with the quality of these fasteners, and continue to use them everyday. 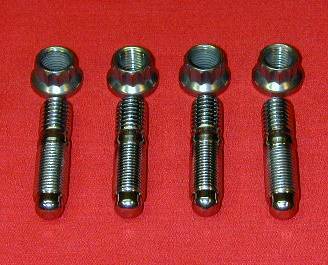 Thanks for offering a single source for quality fastners for H-D’s. I race a Harley V Rod Destroyer here in Orlando area. I bought it after it had been sitting at the dealer for over 6 years. All of the factory bolts had become chalky. This kit was the first answer to my prayers. I bought it from your store on eBay, and have to say that I really doubt that anything that I say will begin to describe the quality of this bolt package. Besides the impressive quality of the hardware, the packaging and even instructions are absolutely amazing! I will be installing theses this week, and will follow up with additional pieces as I go through the bike in the future. Also, I am installing a lighting accent kit for the night races, and thanks to you, I now have beautiful hardware to showcase along with the gorgeous engine. Thanks so much, and I really appreciate your products and customer focus. I will be sure everybody at the track knows where this came from!